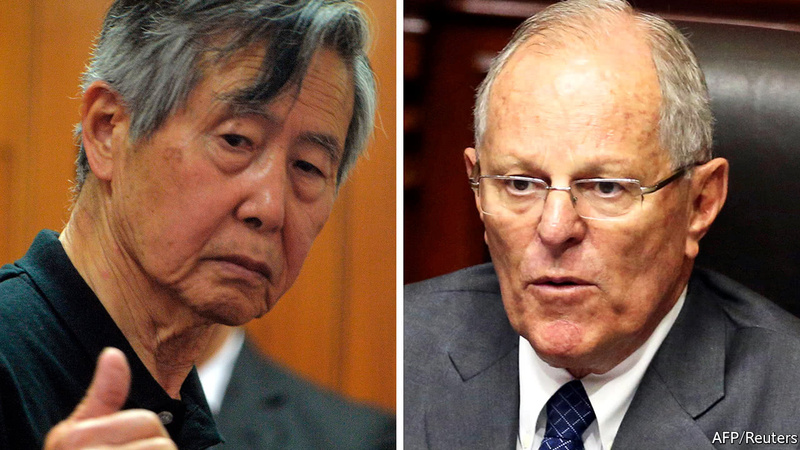 ON THE evening of December 24th, as Peru was preparing for its Christmas dinner, Pedro Pablo Kuczynski, the country’s president, bestowed an unexpected present on a jailed predecessor, Alberto Fujimori: a pardon. This came just three days after Mr Kuczynski hung on to his job thanks to ten fujimorista legislators led by Alberto’s son, Kenji, who abstained in a vote on an attempt to impeach him for links to Odebrecht, a tainted Brazilian construction firm. Mr Kuczynski insisted that the pardon was for “humanitarian reasons”. Few Peruvians believe him. More likely, it was a grubby political deal that bodes ill for his country (see article). Many of his allies feel as conned by this pardon as people who bought fake relics from Chaucer’s pardoner in “The Canterbury Tales”. More than 15 years after the collapse of his decade of autocratic rule, Alberto Fujimori continues to divide his country. His supporters say he saved Peru from hyperinflation and Maoist terrorism and set it on the path of sustained economic growth. For his critics, he was a dictator who shut down congress, destroyed checks and balances, engaged in bribery and was complicit in a death squad. Both are right. But what is indisputable is that Mr Fujimori broke the law. He was found guilty in trials that were legally impeccable. His imprisonment was a landmark for Latin America, a message that all should be equal before the law in a region where the norm has too often been impunity for the rich and powerful. Mr Fujimori has served more than ten years in jail (though that is less than half his sentence). He is 79, has a heart condition and is in remission from cancer of the tongue. Mr Kuczynski’s government has been dogged by the vengeful attitude of Keiko Fujimori, Alberto’s daughter, who narrowly lost the past two elections and who was behind the (disproportionate) attempt to impeach the president. In principle a humanitarian pardon could have been part of a coherent plan of national reconciliation. But that was not Mr Kuczynski’s approach. The pardon was rushed, and backed by questionable medical evidence (there is no reason to think that Mr Fujimori is at death’s door). The government made no effort to consult the victims of Mr Fujimori’s rule, nor to seek a genuine apology from him. Alternatively, a pardon could have been more Machiavellian: a bargaining chip that Mr Kuczynski might have traded for fujimorista support for the institutional reforms—of the judiciary, the civil service and the political system—that Peru badly needs. There is no sign of that either. Instead, it looks like a sordid bargain to let the president survive. From the start, Mr Kuczynski, a businessman and economist, was an accident waiting to happen. He has neither political skills nor, seemingly, any awareness of his lack of them. He won office only because of anti-fujimorista sentiment; in defending himself from impeachment he railed against a fujimorista “coup”. Yet he has now made himself the fujimoristas’ hostage: few of his original supporters will now defend him, especially if it transpires that his dealings with Odebrecht involved more than an undeclared conflict of interest. He would have done better to resign and trigger an early election. The pardoning of Mr Fujimori came days after a similar effort by Michel Temer, Brazil’s stand-in president. He abused the traditional Christmas exercise of presidential indulgence to try to free political cronies jailed for corruption, but the supreme court stood in his way. Thanks to the efforts of prosecutors and judges in places like Brazil and in cases like Mr Fujimori’s, Latin America is starting to enjoy the rule of law. Presidents should not use the power of pardon to undermine it. With Twitter as his Excalibur, the president takes on his doubters, powered by long spells of cable news and a dozen Diet Cokes. But if Mr. Trump has yet to bend the presidency to his will, he is at least wrestling it to a draw. Before taking office, Mr. Trump told top aides to think of each presidential day as an episode in a television show in which he vanquishes rivals. People close to him estimate that Mr. Trump spends at least four hours a day, and sometimes as much as twice that, in front of a television, sometimes with the volume muted, marinating in the no-holds-barred wars of cable news and eager to fire back. In recent weeks, the president made a derogatory reference to Native Americans in front of Navajo guests, insinuated that a television host was involved in the death of an aide and prompted an international incident with Britain by retweeting inflammatory anti-Muslim videos — demonstrating the limits of a staff that has tried hard to steer him away from volatile territory. His approach got him to the White House, Mr. Trump reasons, so it must be the right one. He is more unpopular than any of his modern predecessors at this point in his tenure — just 32 percent approved of his performance in the latest Pew Research Center poll — yet he dominates the landscape like no other. After months of legislative failures, Mr. Trump is on the verge of finally prevailing in his efforts to cut taxes and reverse part of his predecessor’s health care program. While much of what he has promised remains undone, he has made significant progress in his goal of rolling back business and environmental regulations. The growing economy he inherited continues to improve, and stock markets have soared to record heights. His partial travel ban on mainly Muslim countries has finally taken effect after multiple court fights. Jared Kushner, his son-in-law and senior adviser, has told associates that Mr. Trump, deeply set in his ways at age 71, will never change. Rather, he predicted, Mr. Trump would bend, and possibly break, the office to his will. That has proved half true. Mr. Trump, so far, has arguably wrestled the presidency to a draw. Mr. Kelly is trying, quietly and respectfully, to reduce the amount of free time the president has for fiery tweets by accelerating the start of his workday. Mr. Priebus also tried, with only modest success, to encourage Mr. Trump to arrive by 9 or 9:30 a.m. The pace of meetings has increased. Beyond Mr. Kelly and Mr. Kushner, they often include Lt. Gen. H. R. McMaster, the national security adviser; Ivanka Trump, the president’s daughter and senior adviser; Hope Hicks, the communications director; Robert Porter, the staff secretary; and Kellyanne Conway, the president’s counselor. Mr. Trump, who enjoyed complete control over his business empire, has made significant concessions after trying to micromanage his first months in office. 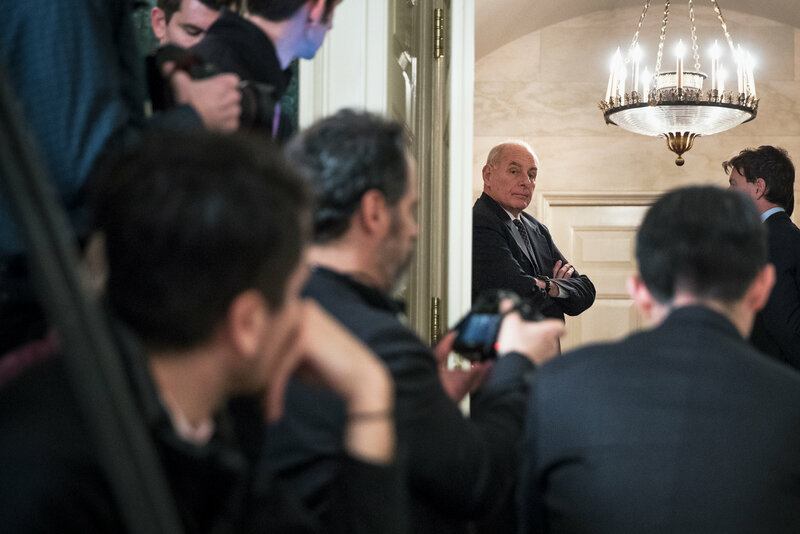 Despite chafing at the limits, the president actually craves the approval of Mr. Kelly, whom he sees as a peer, people close to Mr. Trump said. He calls Mr. Kelly up to a dozen times a day, even four or five times during dinner or a golf outing, to ask about his schedule or seek policy advice, according to people who have spoken with the president. The new system gives him “time to think,” he said when it began. White House aides denied that Mr. Trump seeks Mr. Kelly’s blessing, but confirmed that he views him as a crucial confidant and sounding board. Mr. Kelly has also adopted some of Mr. Trump’s favorite grievances, telling the president recently that he agrees that some reporters are interested only in taking down the administration. At times, Mr. Trump has been able to circumvent Mr. Kelly. Over Thanksgiving at Mar-a-Lago, the president mingled with guests the way he had before the election. Some passed him news clips that would never get around Mr. Kelly’s filters. And he dialed old friends, receiving updates about how they see the Russia investigation. He returned to Washington fired up. Mr. Kelly has told people he will try to control only what he can. As he has learned, there is much that he cannot. For most of the year, people inside and outside Washington have been convinced that there is a strategy behind Mr. Trump’s actions. But there is seldom a plan apart from pre-emption, self-defense, obsession and impulse. Occasionally, the president solicits affirmation before hitting the “tweet” button. In June, according to a longtime adviser, he excitedly called friends to say he had the perfect tweet to neutralize the Russia investigation. He would call it a “witch hunt.” They were unimpressed. He has bowed to advice from his lawyers by not attacking Mr. Mueller, but at times his instincts prevail. When three former campaign advisers were indicted or pleaded guilty this fall, Ty Cobb, the White House lawyer handling the investigation, urged the president not to respond. If he did, it would only elevate the story. He was calm at first when his former national security adviser, Michael T. Flynn, pleaded guilty. The next morning, as he visited Manhattan for Republican fund-raisers, he was upbeat. He talked about his election and the “major loser” in the Senate who had said his tax bill would add to the deficit (presumably meaning Senator Bob Corker, Republican of Tennessee). By Sunday morning, with news shows consumed by Mr. Flynn’s case, the president grew angry and fired off a series of tweets excoriating Mrs. Clinton and the F.B.I., tweets that several advisers told him were problematic and needed to stop, according to a person briefed on the discussion. Once he posts controversial messages, Mr. Trump’s advisers sometimes decide not to raise them with him. 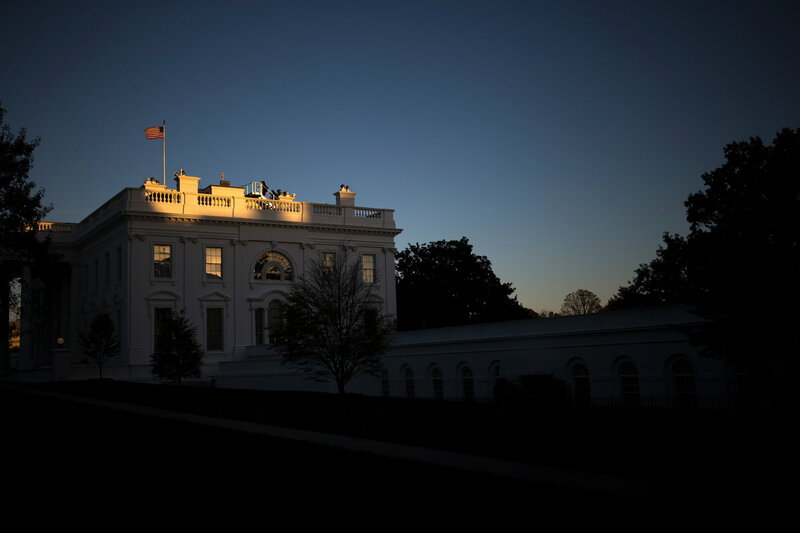 One adviser said that aides to the president needed to stay positive and look for silver linings wherever they could find them, and that the West Wing team at times resolved not to let the tweets dominate their day. The ammunition for his Twitter war is television. No one touches the remote control except Mr. Trump and the technical support staff — at least that’s the rule. During meetings, the 60-inch screen mounted in the dining room may be muted, but Mr. Trump keeps an eye on scrolling headlines. What he misses he checks out later on what he calls his “Super TiVo,” a state-of-the-art system that records cable news. Watching cable, he shares thoughts with anyone in the room, even the household staff he summons via a button for lunch or for one of the dozen Diet Cokes he consumes each day. But he is leery of being seen as tube-glued — a perception that reinforces the criticism that he is not taking the job seriously. On his recent trip to Asia, the president was told of a list of 51 fact-checking questions for this article, including one about his prodigious television watching habits. 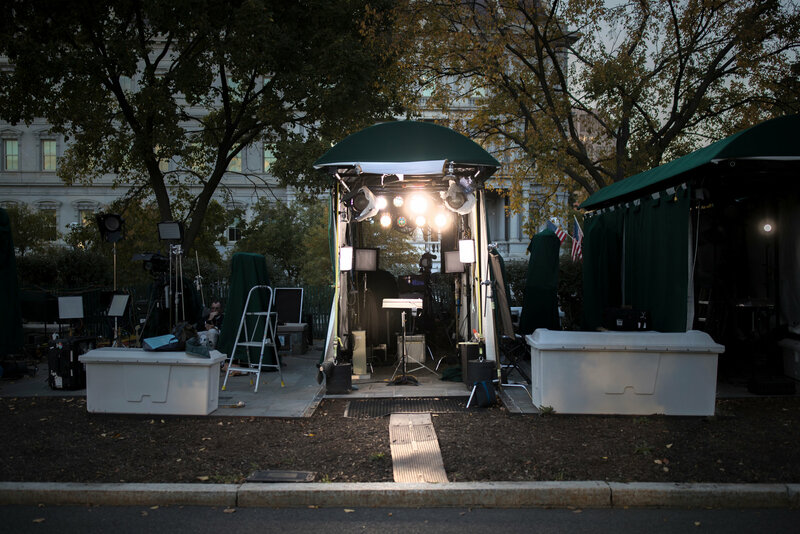 Instead of responding through an aide, he delivered a broadside on his viewing habits to befuddled reporters from other outlets on Air Force One heading to Vietnam. Later, he groused about being forced to watch CNN in the Philippines because nothing else was available. During the morning, aides monitor “Fox & Friends” live or through a transcription service in much the way commodities traders might keep tabs on market futures to predict the direction of their day. If someone on the show says something memorable and Mr. Trump does not immediately tweet about it, the president’s staff knows he may be saving Fox News for later viewing on his recorder and instead watching MSNBC or CNN live — meaning he is likely to be in a foul mood to start the day. Yet the image of him in a constant rage belies a deeper complexity for a man who runs in bellow-and-banter cycles. Several advisers said the president may curse them for a minor transgression — like bringing an unknown aide into his presence without warning — then make amiable small talk with the same person minutes later. Few get to see those other parts and pieces. In private moments with the families of appointees in the Oval Office, the president engages with children in a softer tone than he takes in public, and he specifically asked that the children of the White House press corps be invited in as they visited on Halloween. Yet he does little to promote that side, some longtime friends say, because it cracks the veneer of strength that he relishes. Only occasionally does Mr. Trump let slip his mask of unreflective invincibility. During a meeting with Republican senators, he discussed in emotional terms the opioid crisis and the dangers of addiction, recounting his brother’s struggle with alcohol. His vision of executive leadership was shaped close to home, by experiences with Democratic clubhouse politicians as a young developer in New York. 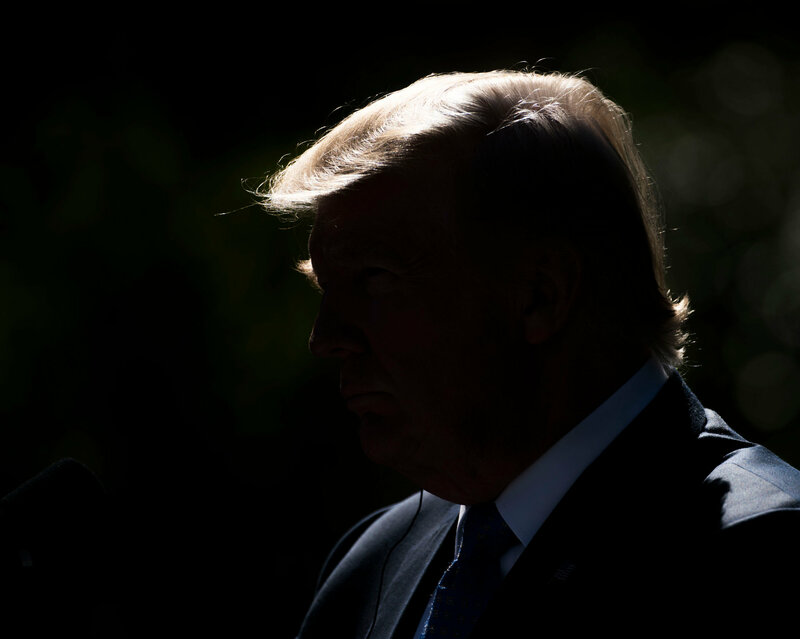 One figure stands out to Mr. Trump: an unnamed party boss — his friends assume he is referring to the legendary Brooklyn fixer Meade Esposito — whom he remembered keeping a baseball bat under his desk to enforce his power. To the adviser who recounted it, the story revealed what Mr. Trump expected being president would be like — ruling by fiat, exacting tribute and cutting back room deals. But while he is unlikely to change who he is on a fundamental level, advisers said they saw a novice who was gradually learning that the presidency does not work that way. And he is coming to realize, they said, the need to woo, not whack, leaders of his own party to get things done. During his early months in office, he barked commands at senators, which did not go over well. “I don’t work for you, Mr. President,” Mr. Corker once snapped back, according to a Republican with knowledge of the Exchange. 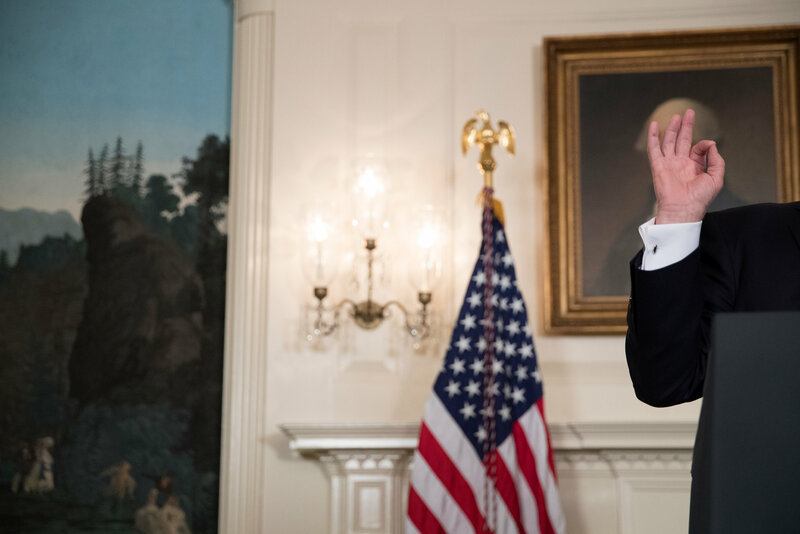 Senator Mitch McConnell of Kentucky, the Republican majority leader, likewise bristled when Mr. Trump cut in during methodical presentations in the Oval Office. “Don’t interrupt me,” Mr. McConnell told the president during a discussion of health care. Mr. Trump may have gotten the message. After a bout of public feuding last summer, he and Mr. McConnell reconciled and began speaking most days. And as the president increasingly recognizes how much Congress controls his fate, Marc Short, the legislative affairs director, has sought to educate him by appealing to Mr. Trump’s tendency to view issues in terms of personality, compiling one-page profiles of legislators for him, the congressional equivalent of baseball cards. While he is no policy wonk — “nobody knew that health care could be so complicated,” he famously said at one point — he has shown more comfort with the details of his tax-cutting legislation. And aides said he had become more attentive during daily intelligence briefings thanks to pithy presentations by Mike Pompeo, the C.I.A. director, and a deeper concern about the North Korea situation than his blithe, confrontational tweets suggest. “At first, there was a thread of being an impostor that may have been in his mind,” said Representative Nancy Pelosi of California, the House Democratic leader, who has tried to forge a working relationship with the president. In almost all the interviews, Mr. Trump’s associates raised questions about his capacity and willingness to differentiate bad information from something that is true. Monitoring his information consumption — and countering what Mr. Kelly calls “garbage” peddled to him by outsiders — remains a priority for the chief of staff and the team he has made his own. Even after a year of official briefings and access to the best minds of the federal government, Mr. Trump is skeptical of anything that does not come from inside his bubble. Other aides bemoan his tenuous grasp of facts, jack-rabbit attention span and propensity for conspiracy theories. Mr. Kelly has told people he pushed out advisers like Stephen K. Bannon and Sebastian Gorka, who he believed advanced information to rile up Mr. Trump or create internal conflict. But Mr. Trump still controls his own guest list. Jeanine Pirro, whose Fox News show is a presidential favorite, recently asked to meet about a deal approved while Mrs. Clinton was secretary of state that gave Russia control over some American uranium, which lately has become a favorite focus of conservatives. Mr. Trump, Mr. Kelly and Donald F. McGahn II, the White House counsel, met for more than an hour on Nov. 1 as Ms. Pirro whipped up the president against Mr. Mueller and accused James B. Comey, the former F.B.I. director, of employing tactics typically reserved for Mafia cases, according to a person briefed on the meeting. The president became visibly agitated as she spoke. “Roy Cohn was my lawyer!” he exclaimed, referring to the legendary McCarthy-era fixer who mentored Mr. Trump in the 1980s, suggesting that was the type of defender he needed now. At another point, Mr. Kelly interrupted. She was not “helping things,” he said, according to the person briefed. Even Mr. Trump eventually tired of Ms. Pirro’s screed and walked out of the room, according to the person. “He wears you down,” Mr. Schwartz said. Some of the changes resulting from Mr. Kelly’s arrival have been subtle. 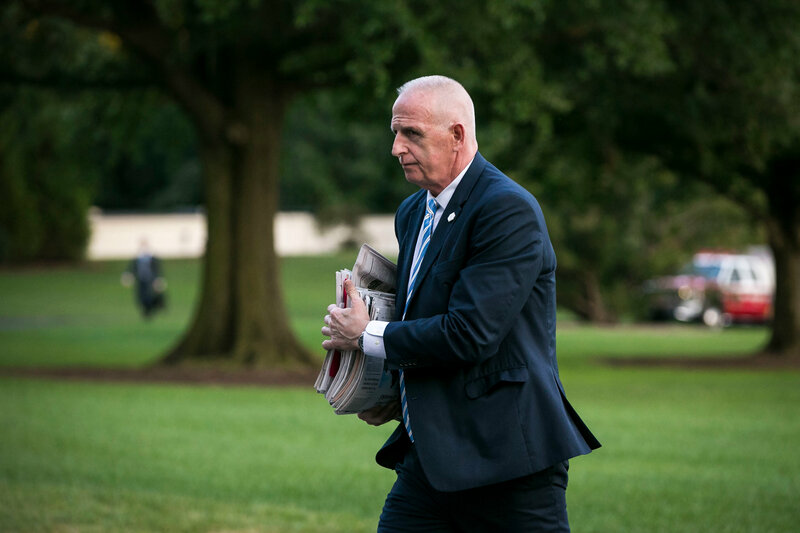 For the last decade, for example, Mr. Trump’s most trusted aide was his longtime security chief, Keith Schiller, a bald, brawny former New York police officer who played an ambiguous role as protector, gatekeeper and younger brother to the president. An early warning system, Mr. Schiller tipped callers when the boss was in a bad mood and sometimes reached out to the president’s friends to urge them to buck him up. In August, Mr. Trump asked Mr. Schiller for a newspaper article he had heard about. After Mr. Trump mentioned the article to Mr. Kelly, the chief of staff dispatched two aides to investigate how it had gotten to the president without being cleared. Mr. Schiller acknowledged providing the contraband newsprint. Mr. Kelly thanked him tersely for coming forward, according to two people Mr. Schiller later told. To the surprise of aides, the president did not try to make clear Mr. Schiller’s unique place in the Trump orbit. After some additional encounters with Mr. Kelly, Mr. Schiller announced his departure, a decision fueled primarily by a dislike for Washington and a desire to once again earn private-sector pay before retiring. 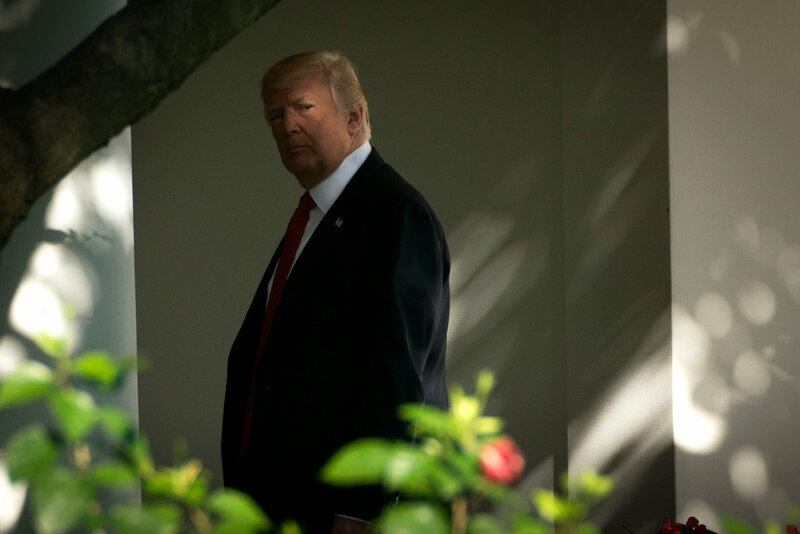 Since then, Mr. Trump has repeatedly expressed frustration at Mr. Schiller’s absence, telling a visiting lawmaker that his Oval Office suite now seems “empty.” The departure of other familiar faces has been equally unsettling. Once this fall, Mr. Trump lashed out at an aide he had not seen for weeks, asking, “Where the hell have you been?” When the aide told him that Mr. Kelly had limited the meetings he could attend, the president cooled off and said, “Oh, O.K.,” according to an aide told of the exchange. If Mr. Kelly knows he cannot always control access, he is intent on at least knowing who is peddling what to his boss. He reserves the right to listen to calls coming to the president through the White House switchboard. To some callers, Mr. Kelly politely promises to forward messages. On calls he cannot monitor personally, Mr. Kelly or a deputy will usually double-back to debrief the caller on any promises the president may have made in unguarded moments. Mr. Trump seeks release on the golf course on weekends. 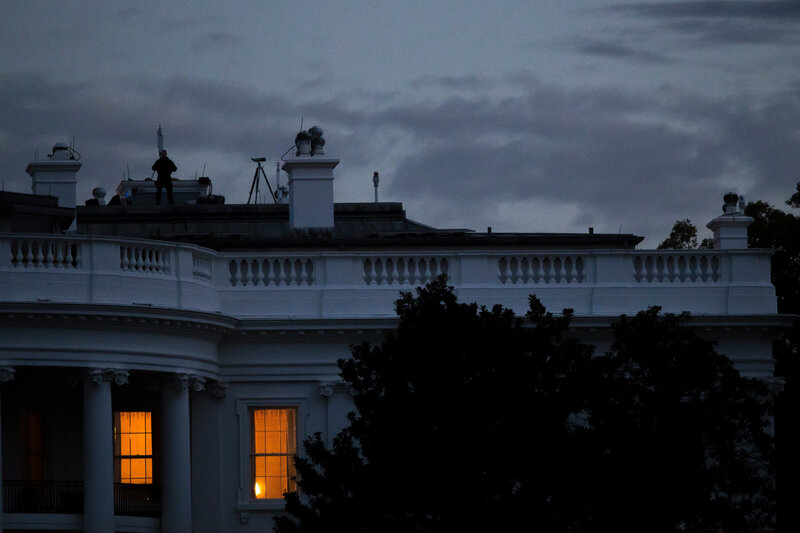 But on weekdays, his principal mode of blowing off steam is his nightly dinner in the White House residence, which begins at 6:30 or 7 p.m. with a guest list organized by the ever-vigilant Mr. Kelly. “I can invite anyone for dinner, and they will come!” Mr. Trump marveled to an old friend when he took office. Mr. Trump has always relished gossiping over plates of well-done steak, salad slathered with Roquefort dressing and bacon crumbles, tureens of gravy and massive slices of dessert with extra ice cream. He needs support, a sounding board and, as a lifelong hotelier, guests. Mr. Trump is naturally garrulous, and loves to give White House tours. He has an odd affinity for showing off bathrooms, including one he renovated near the Oval Office, and enjoys pulling dinner companions into the Lincoln Bedroom or onto the Truman Balcony for the postcard view of the city he has disrupted. Over the summer, he invited four Democratic lawmakers and immediately peppered them with questions as they strolled through the Diplomatic Reception Room. “Who is going to run against me in 2020?” he asked, according to a person in attendance. “Crooked Hillary? Pocahontas?” — his caustic nickname for Senator Elizabeth Warren, Democrat of Massachusetts, who once claimed Native American heritage in a law school directory. Senator Bernie Sanders of Vermont, the president opined, would definitely run — “even if he’s in a wheelchair,” Mr. Trump added, making a scrunched-up body of a man in a wheelchair. Mr. Trump still takes shots at Mark Cuban, a fellow rich-guy reality star, and expresses disappointment that Tom Brady, the New England Patriots quarterback, has distanced himself. But he spends much of his time now puzzling over political options and wrestling with the terrifying responsibilities of the presidency. 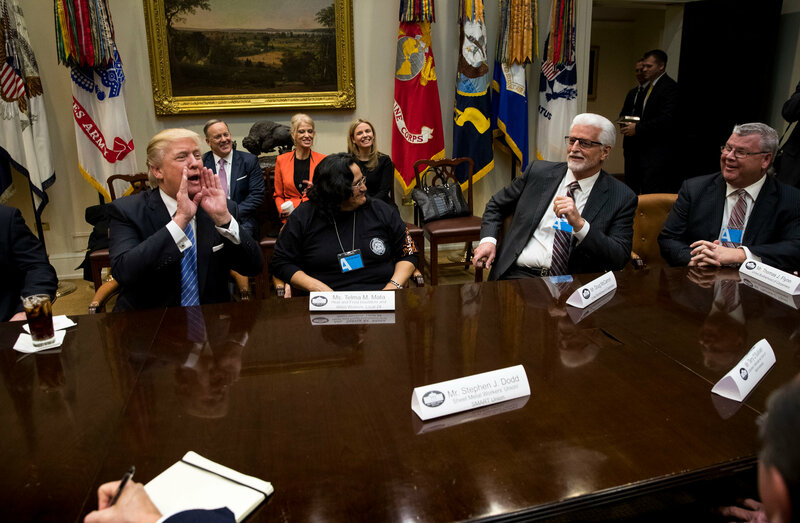 Even when Mr. Trump is in a lighthearted mood, hints of anxiety waft over the table like steam over a teacup. In September, he met with evangelical leaders to reassure them that he would still pursue their agenda despite a flirtation with Democrats. “The Christians know all the things I’m doing for them, right?” he asked, according to three attendees, who reported praising his positions on issues like abortion and Planned Parenthood. When the guests depart, the remote control comes back out. He is less likely to tweet at this hour, when the news he would react to is mostly recycled from hours earlier. But he watches Ms. Pirro and her fellow Fox News hosts Sean Hannity and Laura Ingraham, and sometimes “hate-watches” CNN to get worked up, especially Don Lemon. In between, it is time for phone calls, to people he has fired like Corey Lewandowski and Mr. Bannon, old friends like Thomas J. Barrack Jr. and Richard LeFrak, and more recently Republican lawmakers, especially Representative Mark Meadows of North Carolina, the head of the conservative Freedom Caucus. This is when his fixations are unfettered: Russia, Mrs. Clinton, Barack Obama, the “fake news” media, his bitter disappointment with Attorney General Jeff Sessions. In recent weeks, Mr. Trump’s friends have noticed a different pitch, acknowledging that many aides and even his own relatives could be hurt by Mr. Mueller’s investigation. As for himself, he has adopted a surprisingly fatalistic attitude, according to several people he speaks with regularly. “It’s life,” he said of the investigation. From there it is off to bed for what usually amounts to five or six hours of sleep. Then the television will be blaring again, he will reach for his iPhone and the battle will begin anew. Glenn Thrush contributed to this article before he was suspended pending the result of an investigation into allegations of inappropriate behavior. Matt Apuzzo also contributed reporting. Bitcoin has transformed from an idea that some treated with great enthusiasm to an asset of strikingly growing value. It is digital currency, of which there are many others, and its price has soared in recent weeks. I will admit to not understanding what bitcoins are in principle, to the extent that I have not even been able to define my own questions. But now that I have developed some basic level of understanding, my core question is this: Is bitcoin a currency designed to facilitate commerce, or is it a commodity that has intrinsic value, which rises and falls according to supply and demand? A currency can be treated as a commodity, being bought and sold to take advantage of fluctuations in its value relative to other currencies and assets. But its primary purpose is to facilitate exchange within and between societies. The alternative exchange mechanism is bartering, in which the price of a pair of shoes is defined relative to myriad other unique items, from corn to books and beyond. The problem with this is that without a common currency that provides a common and understandable valuation of each item, the process of trade, from investment to purchasing food, slows with major consequences for the economy. Alternatively, a currency arises with an exchange value separate from its use value. One example is gold, whose use value is somewhat limited, while its exchange value has been much higher, providing a stable basis for commerce. Relative stability in the price of the currency is essential. If it fluctuates wildly and consistently, then it becomes a less efficient pricing mechanism for exchange. Prices always swing up and down, but their fluctuation cannot be so great that buyers and sellers hesitate to set prices for goods and services denominated in that currency, as the currency is no longer a reliable store of value. Currencies have on occasion plunged in value, causing economic paralysis and political chaos. They rarely soar in value overnight. There are many who argue that the contemporary currencies, not backed by a fixed amount of gold, are not stores of value. But currencies are backed by the degree to which owning the currency enables you to enter the market of the nation that issues that currency and purchase goods and services at will. It is guaranteed by the fact that its price is sufficiently stable, moving by a few percentage points relative to other currencies, and by the fact that the U.S. dollar can be turned into any item in the American economy at will and transported out of the country. The dollar is the world’s reserve currency in part because the U.S. constitutes about a quarter of the world’s economy. The dollar therefore provides access to the largest market of goods and services that have use value, and therefore exchange value. Bitcoin has not behaved anything like a currency. The recent surge in its value creates massive uncertainties. For example, should traders postpone sales of goods and services sold through bitcoin because they might receive a higher price for the same number of bitcoins tomorrow? Should buyers put off purchases to wait for the value of bitcoin to decline? Are bitcoins, like traditional currencies, divisible into smaller denominations to allow for variations in prices? These are questions that a healthy currency doesn’t pose to its users. There are fluctuations in value but ideally not to the point that all purchases become gambles. Bitcoin has been behaving more like a commodity. Commodity values can surge – although usually not like this – and while commodities can be bartered, in general they are not used as currencies. If it is indeed a commodity, the next question to be asked is: What commodity is it? A commodity is an object with use value. That use value creates an exchange value, which is modified by market expectations. Bitcoin’s value is determined entirely by market expectations. The dollar’s value is stated relative to goods and to other currencies. Bitcoin’s value is defined only relative to the dollar. But the key is that bitcoin as a commodity has only an exchange value. It represents no underlying object with use value. Obviously, any object can have value if others are willing to purchase it. Some purchases may be made in bitcoins, but given the hourly fluctuation in its value relative to the dollar, it might not be prudent. It is very difficult to use bitcoin as a currency, since the price of goods valued in bitcoin is currently rising dramatically. It is precisely that dramatic rise that holds open the possibility of a decline. Many seem to have made fortunes in bitcoin. They will soon start taking their profits, to be stored in dollars or real estate. And the problem with bitcoin, unlike real estate or tungsten, is that it has no intrinsic value beyond people’s confidence, and confidence is the most volatile of things. Commodity markets are now preparing to trade in bitcoin futures. Brokers will allow bets on anything because they are bookies and take a cut of every transaction, whether the value of the thing being traded rises or falls. Brokers create markets, and the market they are creating is for a commodity that exists only as digital code. Its value, like that of the dollar, is its ability to use bitcoins to purchase things. That depends, in the U.S. at least, on the willingness of owners of things to accept bitcoins. And that depends on bitcoin’s stability. It is neither fish nor fowl, and its advocates argue that that’s its virtue. I have trouble seeing the virtue, but it may be there. But both pricing it as a commodity when no commodity exists and trying to make it behave as a currency seem problematic. The problem is not that it is not issued by the government, nor that it is unregulated. The problem is that it is hard to see what it is. ARTIFICIAL intelligence (AI) has already changed some activities, including parts of finance like fraud prevention, but not yet fund management and stock-picking. That seems odd: machine learning, a subset of AI that excels at finding patterns and making predictions using reams of data, looks like an ideal tool for the business. Yet well-established “quant” hedge funds in London or New York are often sniffy about its potential. In San Francisco, however, where machine learning is so much part of the furniture the term features unexplained on roadside billboards, a cluster of upstart hedge funds has sprung up in order to exploit these techniques. These new hedgies are modest enough to concede some of their competitors’ points. Babak Hodjat, co-founder of Sentient Technologies, an AI startup with a hedge-fund arm, says that, left to their own devices, machine-learning techniques are prone to “overfit”, ie, to finding peculiar patterns in the specific data they are trained on that do not hold up in the wider world. This is especially true of financial data, he says, because of their comparative paucity. Share-price time series going back decades still contain far less information than, say, the image data used to train Facebook’s facial-recognition algorithms. The trick, then, is to take a more thoughtful approach to deploying AI. Technical prowess obviously matters; Sentient employs a couple of dozen AI experts and constantly researches new methods. But business models matter enormously, too. Sentient started out as a tiny fund a decade ago, managing only its own founders’ money. In the past three years it has expanded into other applications for AI, such as online shopping and website optimisation. Only earlier this year did it launch a hedge fund open to outside money, on which it hopes to apply the insights gleaned elsewhere in its investment arm. Another San Francisco hedge fund that draws on an even wider pool of expertise, by virtue of its unusual business model, is Numerai, a firm founded in 2015 that launched its first fund this autumn. It starts by taking financial data and then encrypts them so that they are unrecognisable. Its chief operating officer, Matthew Boyd, says this turns them into a “pure math problem”. The idea is that this avoids biases creeping into models—and appeals to Valley types better than the grubby business of picking securities. It then runs two-stage competitions for machine-learning algorithms that perform best on the data. Some 1,200 data scientists now take part weekly, competing for virtual prizes (in the fund’s own cryptocurrency) in the first round and cash prizes in the second. That structure seeks to encourage algorithms that do well at picking winners over time. The firm takes the results of the best algorithms, decrypts these results back into financial data, and uses the insights to decide which shares to trade. The fund owes at least as much to crowdsourcing, then, as it does to harnessing AI. One hedge fund that does tout its machine-dependent model, despite naming itself after the human brain, is Cerebellum Capital. Founded as an arbitrage fund in 2008, it started work on a fully AI-run American equity fund in 2016, and launched it in April this year. The fund uses machine learning not just to crunch data and come up with strategies. The classification system that gauges the relative merits of these strategies is itself run by machine learning. But humans do the actual trading, following the algorithm’s instructions. However they perform in the long term, therefore, one feature of these new AI funds is already clear. 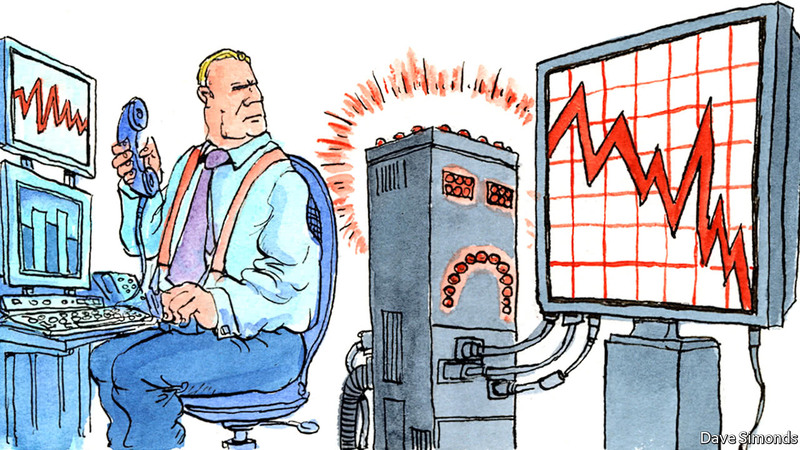 At least in investing, more artificial intelligence does not necessarily mean less of the human kind. BERKELEY – Intelligent machines are transforming the way we produce, work, learn, and live throughout the world. Almost every aspect of our economies will be radically altered. Major logistics companies and individual drivers are using new technologies to optimize their route planning. Companies like BMW and Tesla have already released self-driving features in their automobiles, which are produced with the help of sophisticated robots. The Associated Press is using artificial intelligence to help write news stories. 3D printers are being used to produce replacement parts – for both machines and humans. AT&T, in collaboration with Udacity, is offering online “nanodegrees” in data analytics. Drones are delivering health supplies to remote locations in poor countries. These marvelous new technologies promise higher productivity, greater efficiency, and more safety, flexibility, and convenience. But they are also stoking fears about their effects on jobs, skills, and wages. Feeding these fears is a recent study by the University of Oxford’s Carl Frey and Michael Osborne, and another by the McKinsey Global Institute (MGI), which find that large shares of employment in both developing and developed countries could technically be automated. 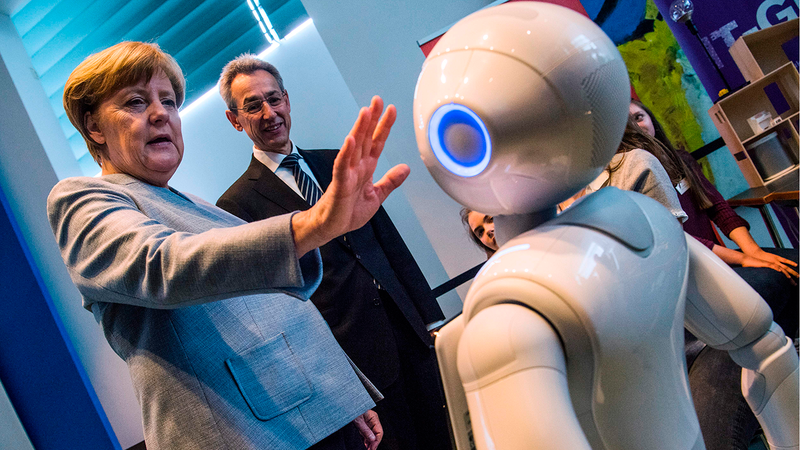 History and economic theory, however, suggest that anxieties about technological unemployment, a term coined by John Maynard Keynes nearly a century ago, are misplaced. In the future, as in the past, technological change is likely to fuel productivity gains and income growth, boosting demand for labor. Add to that lower prices and rising quality, and demand for goods and services will also increase. Many of the jobs created cannot even be imagined today, just as few people a century ago could have anticipated that automobiles would give rise to drive-through restaurants and roadside motels. A new MGI report finds that under a moderate scenario for the speed and breadth of automation, about 15% of the global workforce, or 400 million workers, could be displaced between now and 2030. A faster pace of automation would trigger greater displacement. The good news is that as a result of projected increases in demand for goods and services – driven primarily by rising incomes, the growing health-care needs of aging populations, and investment in infrastructure, energy efficiency, and renewables – enough new jobs are likely to be created to offset job losses. But the new jobs will differ mightily from the jobs displaced by automation, imposing painful transition costs on workers, businesses, and communities. Depending on the pace of automation, 75-375 million workers, or 3-14% of the global workforce, will need to change occupational categories by 2030. In the United States and other developed economies where automation is likely to occur more rapidly, 9-32% of the workforce may need to change occupational categories and the skills associated with them. In these countries, jobs in major occupational categories like production and office support, and jobs requiring a high school education or less, are likely to decline, while jobs in occupational categories like health and care provision, education, construction, and management, and jobs requiring a college or advanced degree, will increase. According to one recent survey, the majority of Americans are concerned that automation will increase income inequality. Their concern appears warranted. As many middle-wage occupations succumb to automation, income polarization in the US and other developed countries is likely to continue. If workers displaced by automation are unable to find new jobs quickly, frictional unemployment will rise, putting downward pressure on wages. So, what can be done to speed and ease the occupational transitions that automation will compel? For starters, fiscal and monetary policies to sustain full-employment levels of aggregate demand are critical. Policies to promote investment in infrastructure, housing, alternative energy, and care for the young and the aging can boost economic competitiveness and inclusive growth, while creating millions of jobs in occupations likely to be augmented, rather than displaced, by automation. A second response must be a dramatic expansion and redesign of workforce training programs. Over the past two decades, government outlays for skills training and labor-market adjustment have fallen in most OECD countries. That has been compounded in the US by a sizeable decline in business spending on training as well. These trends must be reversed. Lifelong learning needs to become a reality. Jobs will change as machines take over some tasks, and human activities will require different skills. MGI’s analysis shows that higher-level cognitive abilities – such as logical reasoning, stronger communication skills, and enhanced social and emotional skills – will become more important, while machines take over routine capabilities common in the workplace today, including in cognitive tasks like data collection and processing. For mid-career workers with children, mortgages, and other financial responsibilities, training that is measured in weeks and months, not in years, will be necessary, as will financial support to undertake such training. Sending people for two-year degrees at their own expense is not the answer. Instead, nanodegrees and stackable credentials are likely to gain in importance. German-style apprenticeships combining classroom work and practical work, and enabling participants to earn a salary while learning, could be important solutions even for middle-aged displaced workers. Collaboration between companies and educational institutions, as AT&T (on whose board one of the authors serves), Starbucks, and other firms are showing, can provide workers with the new or enhanced skills that are increasingly needed. Tax and other incentives to encourage more business investment in workforce training, especially by small and medium-size companies, may be necessary. Governments will also need to offer universal and portable social benefits like health care, child care, and retirement security, as well as transition support, to workers who are forced to change jobs, occupations, and employers frequently. Sweden’s job-security councils, run by the private sector and funded by a payroll tax on companies, provide displaced workers with a comprehensive suite of income support, training, coaching, and assessment with caseworkers. Like previous technologies, automation today promises major productivity gains, benefiting individuals, communities, and societies. But, for millions of workers, the path to an increasingly automated future could be long and difficult. It is up to us to make the policy and investment choices that can ease the transition, reduce its costs, and ensure that the income gains are equitably shared.